+1. i'm in the mood to ride fast. anyone game for another record attempt? yeah, I don't anticipate that it would be a successful record-break, but it would be fun to try and i'm curious as to what we could pull off without wind assistance. brother, i'm tired, with sore legs and wheezing lungs. but sure, why not. if xton can change his ways and not attack, it might work. the key to a fast overall time is moderation and teamwork, meaning very steady, regular pulls at sub-100% effort, with no surging off the front... can it be done? all we need is >21.2mph average, easy right? mike and his spankin' new DA 7900-equipped Wilier Triestina "46 ton" will be required. Okay I'm in too. Should be good. I'm guessing 7 AM was sufficient if you could hang. As we approached the BTN, I steeled myself - knowing I needed to cross the bridge with much more flair than my usual timid approach. I backed off to get some space and cross in my own zen. Cleared both the ascent and descent without problem, but the gap I had let form plus a few extra seconds spent congratulating myself and I entered the parking lot on the other side 30 yards OTB. That was more than enough. I chased like a madman and finally lost sight of the leading trio at Marsh Road. I backed off at that point and still rolled by google at 9:20 AM. Fast enough to hang, not fast enough to continually close the little gaps that always form on Bayway. Not bad for an old fat dad though. And clearly this was the right day to bike to work. Excited to be back in SF and making a record attempt I arrived at Ritual at 6:45 and fueled up with a scone and double espresso. I had the first inklings of the doom to come when Scott showed up on a shiny CAAD8 BB30 with a 11-21 cassette and no backpack. Obviously taking the record attempt way more seriously than I (with my heavy laptop in my backpack). We (Trinh, xton, scrosby, mgaiman, and I) set off a little after 7, immediately raced down Valencia crossed Army and made it to Cortland. It was here that xton and scrosby unleashed the fury and set a blistering pace all the way till Oyster Point. I kept falling back but managed to catch back up most of the way. Right around the airport I snapped and saw the rest of them vanish into the distance. I caught up with Michael and Trinh at the rest stop (and by caught up I mean they waited for me). Michael and I set a good (and more importantly sustainable for me) pace and made it to Google in 2:02:45. I'll leave it to Scott to write what happened up at the front. when i woke up today, two thoughts converged in agreement: legs sore, self favor sleeping more. 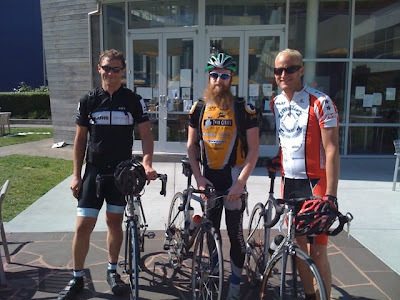 still, drug lethargic self to ritual, where the hobinator and trizzle were looking fresh and already coffee'd up. attempted to get on same page with extra large guatamalan. xton and mike then arrived. at ~7:10, the train left the station. all agreed a fast but sub-100% pace would be adhered to. partway down valencia, mark, heading north, flipped a U-ey and jumped on. it was a windless day. wisely shunning a backpack and laptop, I suffered less up cortland, bayshore, & san bruno than hobe, xton, and mike, who were well-equipped to conduct a meeting and perform excel macros. yet they sent no emails this day. team settled into regular rotation, and kept up a pretty solid 24-25mph, with san mateo trinh doing extra work befitting his early exit. as we pulled into millbrae, surprise! one-kit murph, who baffled us by wearing a different kit, was lurking at the traffic island chatting up a motorcycle cop, and joined the mission. very helpful to have the extra horsepower, as we had lost a couple teammates by then to unknown afflictions. of course then we passed a webcor dude heading north, and murph was despondent to be unable to bond over their mutual green spandexness. 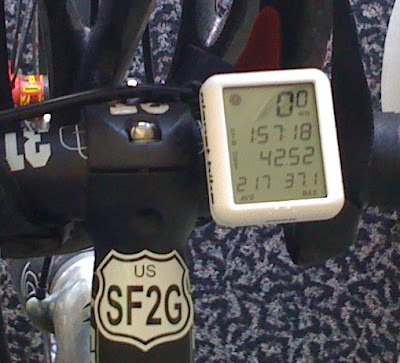 the average hovered around 21mph as the headwind picked up in foster city. despite best efforts, only 22mph could be maintained. still, record-parity pace was hit somewhere around the windtunnel or BTN, when murph decided he'd had enough tomfoolery. the winds went easy on us from then on out, with yours truly, xton, and mark plowing on until mark bailed for work around EPA. mark, who was an unknown quantity, proved himself a tremendous TTTer, with exemplary technique and long pulls into the wind on his vintage serotta, caltrain tag flapping in the breeze. great work. xton and I then ran into a couple of fast-looking riders on e. bayshore who momentarily joined us, but seemed to find us distasteful and departed. at that point i was afraid they'd drop us, heaping ignominy upon defeat. but no, the calories held out this time, due to assiduous devouring of shot bloks and gus, and xton and I rolled across rengstorff dripping great rivers of sweat into our eyes and wobbly, but still rolling. I snickered when xton pondered his 10 miles more to apple, heh heh. probably picked up the pace for that bit. with a proper tailwind and a 4-6 person team, we can beat this for sure.